Last years vegetable beds had to be low maintenance through the summer, as I had a 9 -12 month old baby going from crawling to walking at high speed and generally causing havoc. I was keen for the area to look used and not abandoned. 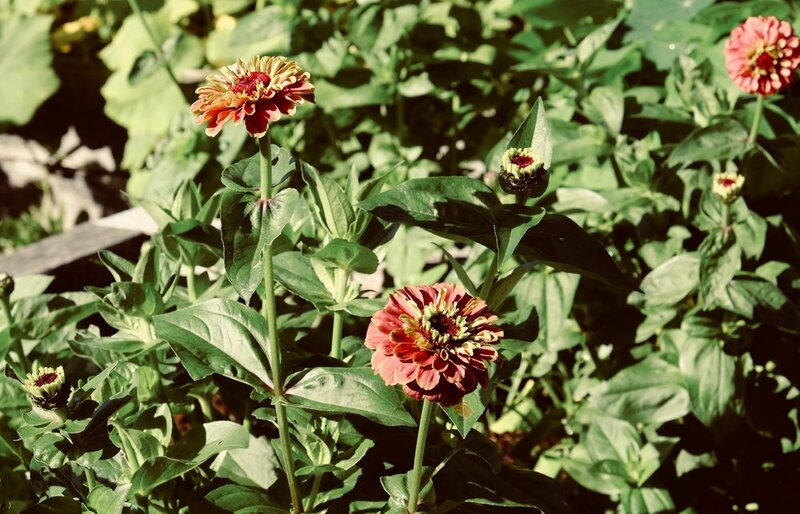 With that ambitious plan in mind, I filled one whole bed with Zinnias which were sown in situ and flowered abundantly from August through to October. So prolific is their flowering season I took bunches of these waxy, long lasting flowers as gifts everywhere I went. They grow neatly and fill a space brilliantly. Then I planted sweet pea plugs, direct sown salads, peas, herbs (summer savoury, dill and tarragon) and strawberries which filled the rest of the planters in an easy way that was still productive and orderly. I have moved on to pulling the same baby down from pieces of furniture so, in order to have my hands free to do that, I'm going to give a bed over to cut flowers again this year. Sarah Raven's website is the most straight forward with lots of ideas for any sized cutting garden. I've just ordered Scabiousa stellata 'Sternkugel' from there to go with phlox 'creme brulee' and scabiosa autropururea 'fata morgana' from the ever reliable Chiltern Seeds. I'll fill a whole 2m x 1.5m bed with just these and hopefully get bountiful cuttings again. Photograph of last years Zinnia bed.